Excel for Everyone: The Simpliest Way to Enter the Rich World of Formulas When looking for the type of job that will help you get ahead in the world, one reoccurring skills gets asked about time, after time, after time. Despite the prevalence of spreadsheet software on every business computer for nearly 30 years, many people are still confounded when it comes to even completing basics tasks in Microsoft Excel. If you are tired of working harder, not smarter, then Excel for Everyone: The Simplest Way to Enter the Rich World of the Calc Spreadsheet is the book you have been waiting for. This book is written for those who have heard about Excel and how useful it is for years, if not decades and are finally ready to take the plunge and learn everything there is to know about Excel basics. It describes everything you need to know when it comes to understanding what Excel is for and when to use it for the best results. Excel: Strategic Use of the Calc Spreadsheet in Business Environment. Data Analysis and Business Modeling. Spreadsheets and the programs that create them are as common in the business world as cubicles and yet many people still donât know how to take full advantage of the software they use to create these ever-present files; despite the fact that it could ultimately save them time, headaches, even money in the long run. If you want to ensure you are getting the most out of your spreadsheet software then, Excel: Strategic Use of the Calc Spreadsheet in Business Environments, Data Analysis and Business Modeling is the book you have been waiting for. This book is written for those who are already familiar with all of the basics that these programs have to offer and are looking to take their game to another level. It describes everything you need to know when it comes to time saving things like making the most of Vertical or Horizontal Lookup features, productivity macros and the spreadsheet programâs extensive filter function. Take action befor price raises! 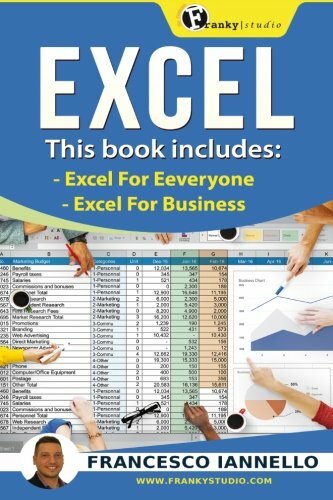 About: 2 Excel Books + 2 Free Bonus Books Included!